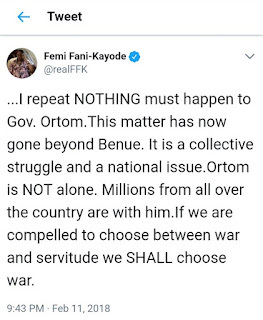 Former Minister of Aviation, Femi Fani-Kayode, has alleged that there may be a plot to kill Benue State Governor, Samuel Ortom. 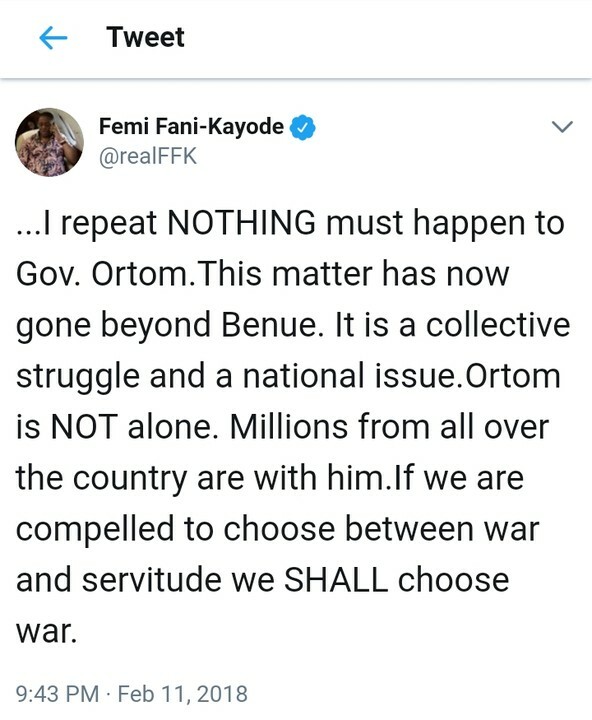 Fani-Kayode, however, warned that nothing must happen to Ortom, or else there will be war. Writing via his official Twitter page, he stated that “this matter has now gone beyond Benue” and “millions from all over the country are with him”. If ANYTHING happens to Gov. Ortom of Benue state there will be a swift and strong retaliation and that will be the end of Nigeria. It is not a crime to pass an Anti-Grazing Law and neither does Ortom or the people of Benue deserve to be killed for it. I repeat NOTHING must happen to Gov. Ortom. This matter has now gone beyond Benue. It is a collective struggle and a national issue. Ortom is NOT alone. Millions from all over the country are with him. “If we are compelled to choose between war and servitude we SHALL choose war.